Charles Hanson and Catherine Southon visit Warwickshire. Our pair gamble on big money buys, from Charles's ailing 17th-century oak chair to Catherine's curious children's toy. Why do I always do this to myself?! Come on, stick 'em up! He's the king, she's the queen. We are in Middle England. Welcome to what I would call the home of heritage. It is beautiful round here. Black and white timber-frame cottages. you make absolutely no sense whatsoever. for all things antiquated and archaic. And chaotic and really rather lovely. Ah, to be or not to be. He learned everything from me. They're driving this green goddess, a 1981 MGB GT. They'll finally finish up in Congleton in Cheshire. and aim for auction in Newport, Shropshire. But what might be their dream buys on this leg, eh? Wondering what else you're going to buy! It's treasure hunting, it's like my hobby of metal detecting. -You don't do metal detecting! I love it. What's so funny?! Catherine's striding towards her first destination. -Hi, I'm Catherine, very nice to meet you. Pleasantries over, time to shop. Oh, now, that's cute, look at that! would be carried by servants or horses. Hm! and probably dates from the 19th century. Dealer Laura owns this little curiosity. Obviously, we've got a stain on the top. What is your very, very best on that? You've got 88 on it. I could do it for 50. I don't think I'd spend any more than 40, to be honest. -You couldn't go to 45? 45, yeah, that's a possibility, yeah. -Can I put that on the back burner? Well, I wouldn't burn it, exactly. This I'm kind of drawn towards. A copper letter rack, yes. It does have a maker's mark on it. where Laura sources a lot of her stock. The ticket price on that is £55. I think I'd want to be more around 20 on that, to be honest. Could we meet in the middle, at 25? With two items reserved, time for a peek outside. How much is the Belfast sink? but that can be cheap. That's music to Road Trippers' ears! to the multi-storied town of Stratford-upon-Avon. Raymondo already has a little item he's keen to show him. Oh, lovely! So what we've got here, it appears to be, what...? Madonna and child? It's a religious scene, isn't it? in 1708, a skill previously only held in East Asia. It carries a mock Meissen mark. -So it's an imitation of Meissen. And this was made in Germany, probably around 1880. -I like it, I like it a lot. but it's still an attractive 19th century lump. You wouldn't do a bit more at all, would you, no? Because to me it's probably worth between £20 and £40. For £25, I'm going to say, well, life is too short, I'll take it. And what's this he's stumbled upon? in front of a dining-room fire. What's your best price on this footman? The price tag is 58. Oh, he can do anything. because I say so... but I might be wrong! He's keen, but what about the price? Would you take 30 for it? Done, thank you very much, that's great. Another deal in the bag. Thank you, Raymondo. and Belfast sink. What a mixture! Dealer Laura's suggesting £85 for the three. Could we do 75 for the three, rather than 85? No, but I could go to 80. -OK, OK, shall we do that? and the sink for 15. And carry on buying en francais. where he's about to trip off into Henley Vintage & Interiors. Always on the run, Charles. Hi, Julie, good to see you. What a lovely shop. What I can see in here already is a nice array of silver. Oh, God, they're really nice! and the monogram of their original owner, and they're very sweet. and we've got the hallmarks on there for London. It's a young sovereign head, so we know they're about 1884. -Have they been here a while? They're lovely. So, four of those. -How much could they be? whether I could buy them at £10 a piece, and go in at £40? and getting along as swimmingly as ever. You're a bit close for my liking. in the pretty Cotswold town of Chipping Campden. She's got £127 left to spend. You're an uptown girl in Chipping Campden. Thank you. And you are? -I'm Rachel. Nice to meet you. -Rachel, lovely to meet you. Catherine will scour this jam-packed place for buys. And she will, you know. in a collection of crockery. whose origins date back to the mid-1800s. decorated with hunting scenes. Rather jolly. -It is quite fun. Yeah. I wouldn't buy the whole lot. -Would you sell those two? Combined ticket price on those is £66. But what might Rachel accept? that have a combined ticket price of £38. I'd be able to have one, two and three for £30. -..at 35, because I really like that. And I hope you do really well on that, yes. So, Catherine has her quarry. the fascinating story of some of the nation's favourite dog breeds. He's meeting breeder Gay Robertson. -I'm fine, nice to meet you. Good to see you, Gay. I'm Charles Hanson. -And who's your friend beside you? Good to see you, Fickle. Hello, I won't bite. I should hope not, Charles. of racing dogs like whippets and greyhounds. as breeds like foxhounds and beagles. Sighthounds have been raced in Britain for many centuries. -..we started with the Romans. -..not to catch it, but to see which dog was the fastest. -And that's been true ever since. and was popular in Britain down the ages. when Queen Elizabeth I took an interest. to draw up a complete set of rules for the sport. And it's because betting figured very, very heavily. And you don't want somebody saying "S'not fair!" You know? No, you don't, do you? turn the hare most often, and score the most points. and regularly drew large crowds to coursing events. Wow! Such was the popularity of greyhounds? The whole thing was very popular. particularly in working-class mining areas of the 19th century. mining was a big thing. And whippets were more user-friendly than greyhounds. than you earned in a week. as all of Gay's whippets have been trained to do. with no risks to wildlife. I think the hooligan, he's the quickest, almost as quick as me. So, so this activity's all part of their training? It keeps them in good shape...? They just love to do it. and hit that finish line, OK? Charles is down! Oh, Lord. I was taken down by a whippet. Bring it home. Imagine that's Catherine Southon, OK? It's like lightning across a field. Come on. Ooh, I've lost my dog now. Once Charles's catches up, it's time to hit the road. I've been delighted to have been here, so thank you so much, Gay. It's been such a revelation and I shall not forget today. So, this is going to come round, like this. You put your grapes in there. That's incredible. more than double what Catherine has remaining. The prices are just way, way over what I have. It's lovely stock, but for another day. and he's got nearly £594 to spend here. Andy is the owner of this fine emporium. With lightning speed, Hanson Hanson's found something. Gosh, what a chair. Look at that for a chair. I'm fairly confident in saying... would date to around 1700. Ticket price on the armchair is a hefty £240. Has it been here a long time? So, that's often a bad sign, isn't it? So, your very, very best price would be...? 100. I can't go any lower. So, Charles will ponder that offer at a cool £100, and browse on. Time to delve into the cabinets on the other side of the shop, eh? is just a very, very nice microscope. What's attractive is this microscope comes in its original fitted box. With its divisions... and original slides. but there is another smaller microscope here, too. This one isn't so good. Andy, how much could the two be together? Make it 25 for the pair. And his beloved ancient chair is still offered at around 100. It's make your mind up time, Carlos. ..the earliest item I've bought so far. It's just a wonderful chair. Anyway, I think for £25, I'll take them. -Andy, I'm delighted with those two purchases. Spent out, or spent up? We all are, Charles. We all are. and the set of four salts. and the collection of Crown Staffordshire. She spent a total of £115. But what do they make of each other's hauls? I do love that miniature sedan chair. It's a really good object, Catherine. I think for £35 it could make £100, so good job. in the shape of pails for £42. It pains me to even think about them. and are now aiming for auction in the Shropshire town of Newport. Things have taken an unexpected turn this morning. so he can't make the auction today. to rally Charles's lots along. Hello there, legendary Road Tripper. I'm good. Thank you for stepping in. -Come on. How are you? David Brettell is the man in command today. Phil's got five minutes to take a nosey at Charles's items. And that's cost Charles Hanson £25. Well, that's very promising, as the sale kicks off. And with internet bidding as well. Can they scope out some cash? See, I'm into profit straightaway. -Oh, all right. All right. We've got 37 on the net, now. 45 bid, 45. 48, 48. Nobody in the room. I sell this time at 48. That scores an enlarged profit for Team Charles and Phil. He had no input on those. I bought those. Hey! I'm sure you bought them in spirit, Philip. Next, it's one for Catherine, as her Belfast sink meets the room. We go ten, 12, 15, 18, £20 bid. Two, five, eight, £30 bid. -I knew this would make money. Didn't I say it all the time? -"Make a good profit on this." Can't say I heard you, Philip. Will be sold. Hammer's up. Anybody else going? No sinking feeling for Catherine, as that earns her a nice little bundle. I learned it all from you. Oh-ho, I don't know about that. but needs a lot of restoration. £10 on the net. 12, 15. -22, got to be sold. Hammer's up. Shout me now. Charlie will be really upset. That's a stinging loss on a chair Charles loved. it's a much better chair than 20 quid. goes hunting for profit. Giddy up. £10 here for the hunting. -This is ridiculously cheap, you know? I'm not selling, I'm giving away now. -He is giving it away. -That is really, really cheap. Oh, chance of a profit gallops off there. It's Charles's set of four silver salts. Can his seasoned stand-in Philip will them to a profit? They've got to make 100. Well, 40, then? It's only a tenner each. £50 bid, £50 got. Five? -I think these are for nothing. It's a decent profit, but our experts hoped for more. They should have made £100. -They are really nice things! as her miniature sedan chair is up. Come on, this is a good thing. I'm selling at 75. 80 on the net. I'm selling, in the room at 100. I still don't think that was that dear. -Just shush, I'm happy with that. As well you might be, Catherine. Thanks, you bring good luck. You're like my little leprechaun. We should get him a hat! will try to ignite some interest. 10, 12, 15, 18, 20 on my left. Sat down here, £20, you're out, £20 bid. 25 bid on the net, now 28 on the net. Hammer's up then. All done, round we go, quickly round at 28. -A little, a little loss. Sadly, that lights no fires for Charles. I'm quite happy for you to come on again. that Catherine felt had some je ne sais quoi. £50 on the net, £50 got. Five, 55 bid, 55 got. 60? Where did that come from? Five on, for Andrea, 65 bid. We've got the two internets playing each other here. cos I always lose money when I'm with Charles. 100 on the net. £100 bid, £100 got. £110? Is he on the same lot? 120 got. 120 you're at, Andrea. That really was something to write home about. I do really like you, Phil. Now it's Charles and indeed Philip's very last shot at a profit. £100 for it. 100 bid on the net. Well, at least he's kind of making it up for the chair. Nobody in the room. £140. Anybody on the UK Auctioneer one? At £140, hammer's up, going to be sold. -Yeah, I always knew that'd make money. -And you would've bought that, wouldn't you? to help the absent Charles on his last lot. Philip was right about that. Charles, ably assisted by Philip, started this leg with £660.98. meaning he has £695.64 to carry forward. and she's made a profit of £110.50. and is this leg's winner. Whoo! And she's put a little bit of a dent in Charles's lead, so well done. as we continue our Road Trip with our antique-hunting faves. What is this armrest thing? -Listen, that is my link to history. That is the most ridiculous thing ever. and will amble their way to an auction in Nottingham. Oh, very good - if only in tune. Get out of here! See you. She's got a little under £320. Mm. Lots of salvage in here. I can feel it. Beep-beep-beep! It was one of those things that came in one of the factories we stripped. So it was just lying about? -Yeah, course you can, yeah. I feel it's very much GO Team Catherine. That's what I... That's what I want to say to Charles. Go Catherine. So what's on this, then? Can you do that for 20? It's certainly a novel buy, Catherine. It's a Road Trip first, certainly. home to his first shop, Circus Home and Salvage. Not forgetting he has just under 700 smackers to spend. Nice to see you. Charles Hanson. -Good to see you, on this busy day. It's lovely. What a gorgeous shop you've got. I love this chest. Almost like a treasure chest, isn't it? and you'll see how over the years that handle has fallen. you can see the daylight through there. But it is maybe 1830, maybe second quarter of the 19th century. It's priced at 48, Leigh. -What could be the best price? cos generally it gets rattled a lot. I suppose, what, 1920s, '30s...? you may have done this. I hope you're remembering all of this, Charles. Oh, hang on, there's more. A mother of pearl penknife. what do we think, just pre-war? It's got a bit of damage, a bit of wear. -How much could it be, Lee? I think you're holding an ear cleaner. -It's got a little scoop out of there. Oh, yes! -Yeah, I'll put it back in, quick. and lots of possible - Charles, it's decision time. ..the penknife and the box, please. OK? Sold. Thank you very much. OK? The next thing is the...rattle. Since you've already bought a couple of things, how about 20 quid? -I'll take it. Thanks a lot. and to the gorgeous village of Hartington. in large 18th-century oak furniture. Ohhh! You can't not touch this beautiful oak. But they do have stock that's a little later, and smaller. And I think that's an original canvas seat. I like that. I think that's quite cute. It's quite a lot of woodworm. Woodworm and a ticket price of £80. One to think about. Anything else? It's got a nice clear hallmark there. would have taken something like that to a dance. She's not going to get an awful lot in there. You're certainly not going to get any notes in there. But you might get a little coin or two. This cigarette case, this is Art Deco. about the little chair and the silver. I'd probably say 20 for that as well. So 40 for the two. -Put it there, then. Thank you very much. shopping for the day is done. Time for a well-earned rest. Nighty night! Day is dawning over the Cheshire countryside. Hang on. Is that Charles? At least he's enjoying himself. "Hello, you're in the modern world. And that actually is a really good sound. Has someone lost a bundle of gold sovereigns or gold guineas? Hold tight. What is lurking under there? And that's it. That is it. What is that? It's certainly Victorian. I'll tell you what that might be. a little spill holder. And maybe you haven't seen that for a few...150 years, or so. I've found real Antiques Road Trip treasure. A real treasure. I'm going to give it to you. There you are. That's just for you. Have a look at it. -It's not a tractor part. I'm fairly sure, romantically, it's a spill holder. Let's get moving while they're still friends, eh? The first stop today is Walgherton in Cheshire. And they're sharing a shop, so stand by. I'm going to go this way. What are you going that way for? Come on, follow me. Come on. -Trust me. Trust me. Come on. Perhaps it's best you split up, you two. -So do stop horsing about. Catherine's got just under £260. They've called it a large vintage dragonfly brooch. It's either really, really horrible, or quite good fun. No risk here, then. Sue owns the contents of this cabinet. I do like the way it's been made. The sort of graduated pearls there. The lovely almost seed pearls on the wings. -You've got 38 on it. What I'd like to offer you is 20. -No, I couldn't do 20. I'd knock ten off the ticket price. I'm not going to argue over a few pounds. her first deal of the day. It is rich pickings, as my Hanson would say. Well, dealer Sam is here to help. That is a brooch in the form of a perfume bottle. There's so many lovely things here! Ooh, I want to buy everything. -it is actually a baby's rattle and a teether as well. and owls are quite collectable. This is actually really nicely done. Amongst all this stock, that's two gems. The 1920s owl rattle has a ticket price of £150. I do like it so I might gamble on it. Well, I can speak for Debbie. I think she wouldn't take anything less than 100 for the rattle. She would do the perfume bottle for 20. Do I do it? What do you think? -Oh, I'd be a devil. -I like to be a devil. Catherine devilishly scoops up the rattle and teether for £100. The scent bottle brooch for 20, and the dragonfly brooch for £26. While she nips off, Charles is looking to spend his £635. Minutes ago... I love this. On a summer day, you often see summer fruits. And they are so Art Deco. Look at the little beaded handles here. They've got that almost skyscraper look. There's a crack running down the rim here. But on that side they're OK.
Against a wall, you can't even see it. Could be yours for £6. Ignore the damage and they're gorgeous. Charles is keen to chat to their vendor. Can you do much on that for me at all? £5. I will pay £5 and they're sold. £5 spent and off he goes. Thanks ever so much. Have a good day. the world's capital of ceramics. in making the local potteries so renowned. Paul Wood is here to tell Catherine the life of Stoke's Josiah Spode. -Lovely to meet you. Welcome to the Spode Museum Trust. Stoke was already a bustling centre for the pottery trade. for his imaginative approach and for one type of pattern in particular. I can't believe the amount of blue and white that you've got here. Spode's blue earthenware is instantly recognisable. It used locally sourced clay which made it cheaper than porcelain. that changed the course of the industry. This is a piece of bone china. The main thing was the use of 50% bone ash in the recipe. and really very stable to fire and make. And you could put wonderful ranges of decorations on it. and it made Spode a household name. the London townhouses of the rich. You're talking about very, very expensive production. But the earthenware was used in the big country homes. Both of these things were continued in parallel production. The bone china developed and grew, but so did the blue. who had grown used to importing china from China. which was considered very chic, very attractive. He developed a way of engraving the pattern so it could be reproduced. against imported porcelain from the Far East. but still required a lot of skill. Paul, one of the Museum trustees, is here to demonstrate. Would you have had originally one person doing that? Yes. There was always a team. and there was a younger, usually girl, who'd cut the paper out first. So a team of four. And they were often a family. The father was often the printer and the wife was the transferor. and then on to transfer paper. -Shall I be your apprentice, then, Paul? now falls to Catherine Southon. a willow-patterned transfer-printed plate again. how many plates, for example? They would produce several hundred a day. so the pressure was on all the time. Oh, my goodness. I can't believe they made so many of these. boasting 22 bottle ovens and employing around 1,000 locals. makes his early bone china highly sought-after. I'm really, really pleased with that. -A plate produced from a 200-year-old engraving. -Thank you very, very much indeed. That is... I shall treasure that. We'll leave Catherine to admire her handiwork. Charles meanwhile has toddled down the road to Stafford. owned by Ian, is his final shop of this leg. Well, I've got a nice little diamond and ruby leopard. Pretty, isn't it? Nine carat gold? That really is quite stylish. the rectangular white metal box. -No, it isn't, but it's quite an unusual thing. Yeah, it is. It's inscribed. FW Hepford, or Hefford, of Tunstall. It is of local interest. And I can't quite work out what, Ian, you'd have used it for. If we just pull it apart. To a humble man from Derbyshire, not Tunstall. So a nine carat gold brooch and a white metal box to consider. There's such a richness of porcelain. Hanson is on the scent all things 18th-century. That's a Chinese porcelain coffee cup of circa 1770. I love it because it's so noble. It was clearly a coffee cup from a once upon a time very important set. On this shelf here, there is one item which is 18th-century. And that's a small Chinese Qianlong. and that's the same period. Yeah, the touch marks are good, and that's 18th-century, circa 1770. On this top here, that one there. It's the 18th-century Chinese Qianlong tea bowl on the top deck. This has a price. That's £20. they could be bought for nothing. Ian...! What is Charles planning to buy? I'm quite keen to do a deal. and these four bits of very old crockery and old plate? four 18th-century joys for £40? Thanks, Ian. I'm really, really grateful. and shopping for the day is done. and the Edwardian penknife, all for a total of £205. and an Edwardian scent bottle brooch. Cor! Busy shopping for our pair. But what do they make of each other's items? Charles, you make enough noise as it is. Why did you buy a rattle as well for £18? Please don't use that at the auction. £18 for that, though, you've got yourself a bargain. is the one that is the biggest speculator. It's the owl-mounted teether . It could make 250, it could make 50. The fourth auction of this trip is upon us. heading for the auction house at Arthur Johnson and Sons. And it's a fairly substantial and, well, complicated complex. My goodness, how many auction rooms? Our auction room is number two today. In charge of proceedings today is auctioneer Phil Poyser. Tell us all about our pair's lots, then, Phil. The panther brooch, it is gold. I think it's going to be what a lot of people would be looking for. I expect £60-£90 on that. It's the sort of novelty piece that people like. I would have thought that could be £30-£50. Live on the internet and a crowd gathering. -It's a very close atmosphere, isn't it? First item to get your pulses racing is Catherine's stop and go sign. Well, I've got three commission bids on it, and I can start it at 25. -Come on, go, go, go. 40 online. 45 is with me. -It's on commission and it's done at £45. You can't grumble with that. Catherine starts things off with a nice profit. -Stop it. I hope it will stop. Stop. Time for Charles's first item of the day, his Edwardian penknife. I've got 15 in the room. In the room, then, at £20. Charles is up and running and that's one profit apiece. and see how things go with Catherine's dragonfly brooch. -£20 I'm bid on this. 35. 40. 45. 50. 55. 60. 75, thank you. At 75, in the room now. -It is such a good thing. That is amazing. Dare I say it, I'm buzzing like a bee. Buzzing like a dragonfly doesn't have the same ring, does it? It's a dragonfly. Sorry about that, but well done. your 18th-century white metal box? 45 is in the room. -£45. At 45. At 45. -It was a hiccup. It was a hiccup. -You can tell who it belongs to, can't you? -At 55. And I sell in the room, we are done at 55. Charles causing a stir and bagging a profit. -To be honest I thought that would do even better. the 1920s teether and rattle. -35. 35 is in the room. At 35. Got you, madam. 40. 40 bid. 45. 65 bid. 70. 75 bid. Come on! It's a good thing. Are you sure? Done at £80. Plenty of interest but sadly that's the first loss for Catherine. It made a bit of a loss. That leaves the door open for Charles. and 18th-century ceramics and plate. At £10. 12. 12 bid. 25 bid on my left. -At £25 bid, at 25. It goes, done at 25. What's £20 between friends, eh? Don't even bother with that one. Let's just move on. Here comes Catherine's Edwardian scent bottle brooch. Bid 20, 20 I've got. 30 bid, 5, 35 bid, 40. 50 bid, at five. 55, 60. -60 bid. On my right at 60. At £60. It's against you online at 60, at £60. Another great profit for Catherine keeps her in the lead. Puff your chest out, girl. Be proud. Now, the football rattle, will it make a noise in the saleroom? At 30 bid, at 30. -£30, bit of history here. -At 30 and I sell. It goes, done at 30. Yeah, the rattle gets a new home and Charles has another profit. This man used one of those rattles back in the 1920s. I was born in '31. -You've just totally insulted him. with her Victorian child's chair, with worm. 15 only bid to start, at 15. I'll take five now. At £30. Against you in the room and online and I sell at 30. Yes, another profit for Catherine. You should be pleased. Pleased as punch. Now, time for Charles' oak carriage box. I've got 20 bid, 20. -It's a nice size as well. All out in the room at £30. -It's going to break even. A new home for the box, but no profit for Charles. Broke even, lost money, doesn't matter. Catherine's final lot is the silver purse and Art Deco cigarette case. I can start it straight in at 50. -At £90, at 90 for the two items together. It's against you online. Make no mistake. At £100 on my left and it goes. An incredible profit for Catherine. I'm doing so well. I want to go before it all collapses. And I want to end it on a high. -You're making me nervous now. -Is that your tummy rumbling? -I'll buy you a sandwich on the way out. -I'll buy you a sandwich. There's a lot riding on our final lot of the day. Charles' nine carat gold brooch. -In the room at 100. -It's got to do a lot more. Being sold. It goes online at 140. A good profit for a good item, but was it enough? This takes his total to an even and rather grand £735. Catherine began with just under £318. going into the final leg. What a competition. And well done. You are slowly catching me up. 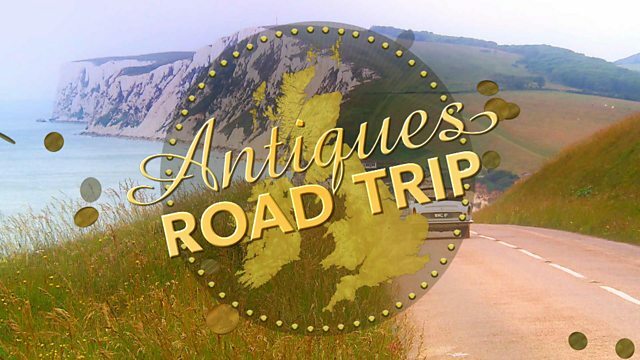 We are back with Road Trip rascals Charles Hanson and Catherine Southon as they skip around the ancient Tudor towns of Warwickshire leading to auctions in Shropshire and Nottingham. Charles makes best friends with Fickle the whippet and Catherine is treated to a visit to the world-famous Spode pottery. Our pair are giddy with excitement as they gamble on big money buys, from Charles's ailing 17th-century oak chair to Catherine's curious children's toy. And watch out for the Phil Serrell cameo appearance.